Gary Wagner threw a no-hitter in the first game he ever pitched — for his college team. Wagner was a right-handed pitcher who worked in 162 major-league games over six years in the majors for two teams, the Philadelphia Phillies and the Boston Red Sox. Four of his games were starts; primarily he worked as a reliever. On June 28, 1940, he was born in Bridgeport, Illinois, a small city about 250 miles almost due south of Chicago. That year’s census showed Bridgeport with a population of 2,143. Wagner grew up there and graduated from Bridgeport High School in 1958, where he lettered in baseball, basketball, football, and track. The Bridgeport basketball team placed second in the state in his senior year. He graduated from Eastern Illinois University. He also played baseball, basketball, and soccer. It was in college in 1961 that he transitioned from his accustomed position as shortstop to become a pitcher. The coach needed someone to fill a gap and asked Wagner if he wanted to do it. Wagner threw a no-hitter, and wound up pitching five other games, winning three of them.4 On September 6, 1961, he was signed to the Phillies by Bruce Connatser. His bonus was reported as $20,000.5 EIU has turned out a number of major-league ballplayers, such as Tim Bogar, Marty Pattin, and Kevin Seitzer. In 1961, Gary married Freddie Jackson. “I was a sophomore in college. She and I were high school sweethearts. I met her when I was 16 and she was 15. We’ve been married 57 years.”6 The Wagners have three sons: Gary, Anthony, and Craig. In 1963, Wagner was jumped all the way to the Single-A Bakersfield Bears in the California League and was 15-13 (3.90) in 201 innings; he struck out 193 batters and walked 108. Until very late in the 1964 season, Wagner pitched for the Chattanooga Lookouts in the Double-A Southern League. He’d been converted to a reliever before the season began, and had an excellent year, appearing in 42 games — all in relief — with a 1.84 ERA. His record was 6-6. He struck out more batters (86) than he pitched innings (83). At the tail end of the season, he joined the Triple-A Arkansas Travelers (Pacific Coast League) and was 1-0 in nine innings over four appearances. His ERA was 3.00. That winter, Wagner pitched in Puerto Rico. The Phillies brought him to big-league spring training as a non-roster invitee and he made the team out of spring training.8 The Phillies approached the 1965 season with great optimism; they had missed winning the National League pennant in 1964 by just one game, tied with Cincinnati for second place behind the Cardinals. For his part, Wagner had said, “I like the bullpen. It’s been good to me. It’s one of the quicker ways to get to the majors. All teams need reliefers, and if you can do the job it’s a pretty good way to make money.”13 There were ups and downs, of course — sometimes in the same day: on July 27, he won the first game of a doubleheader in Pittsburgh but lost the second. All in all, though, it was a very good year. In 1966, though, he spent almost the whole season in the Pacific Coast League with San Diego. Baldschun was traded to the Orioles; he was “considered expendable because of Gary Wagner’s great relief skill.”14 And Roebuck was released. But Wagner came down with a sore right shoulder which bothered him all through spring training, forcing the team to trade for Roger Craig on April 8 to help bolster their relief pitching. Wagner threw only two innings in April and only 2 2/3 innings in all of May. He spent almost three weeks with San Diego in May. Craig went on the DL and Wagner was brought back to Philadelphia, but he was hit for four runs in the second game on June 2, and once Craig came off the DL on June 10, Wagner was sent back to San Diego. He made no more appearances in the big leagues in 1966. In 1967 he made the big-league Phillies but only appeared in one game, on April 30. He worked two innings, giving up just one hit, but was returned to San Diego for the rest of the year. There he started 22 games and compiled a 12-4 record (2.62). He struck out 114 in 165 innings, walking 42. And he helped the Padres beat Spokane for the PCL championship. Wagner won two games, including the Game Six win that gave San Diego the title. That fall, he pitched for the Phillies in the Florida Instruction League (getting in another 44 innings). He was ready to return, but Gene Mauch didn’t need another starting pitcher so Wagner was asked to work out of the bullpen again in 1968. He survived the final cut-down, but wasn’t used much (three times in April, three times in May, and three times in June before Mauch was replaced as manager by Bob Skinner). Skinner had been Wagner’s skipper in San Diego, and gradually began to use him more. Wagner reeled off a string of 18 2/3 innings over eight games without allowing a run, starting on July 29, and in one six-day stretch (August 9-14), he racked up three saves — the first three saves he’d earned all year. Wagner credited Mauch with making a big difference in his being able to come back. “Gene asked me how I’d feel about coming down with my arm six or eight inches. In other words, become a three-quarter pitcher instead of straight over-handed as I’d always been. I tried it and the ball sank real well when I got it down.”16 He added the variation to his repertoire. He worked 78 innings in 44 games, closing 20 of them. His final record was 4-4 with a 3.00 ERA. He was a contributor to a pretty good bullpen, but the Phillies finished seventh. Wagner “found himself” again in Eugene and appeared in 20 games — starting 15 of them. He posted a won/loss mark of 11-5 (including five shutouts) and recorded a 2.05 earned run average. He’d become an attractive commodity and the Boston Red Sox acquired him from the Phillies in a trade for left-hander and then minor-leaguer Mike Jackson. Wagner threw three innings in his first outing for the Red Sox, on September 10, but gave up one run and lost. His next outing saw him throw 5 2/3 innings in relief, earning a 5-2 win over the Yankees. It was almost — but not quite — a start. Vicente Romo was the starter but only threw two pitches and had to leave due to a pulled muscle in his lower left back. Wagner came in and took the game into the sixth, picking up the win. He lost his next two outings, one of them a start. 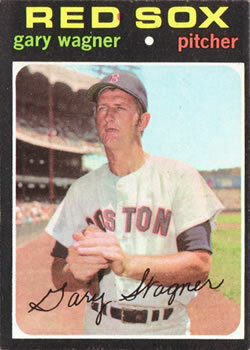 In all, Wagner worked 40 1/3 innings for the Red Sox, and was 1-3 (6.06). He turned those win/loss totals around and went 3-1 in 1970, with a 3.35 ERA in a busy latter half of the season. The Sox had placed him with Triple-A Louisville to start the season. He had done adequately there, with a 3.62 ERA. He was 6-5. Boston brought him up after starter Bill Lee had to report for Army duty and shortstop Luis Alvarado was optioned to Louisville. He won his very first outing with two innings of relief work. By season’s end, he had a 3.35 ERA, and was 3-1 in 38 outings. He began spring training well but in late March his arm began to bother him. “He just wasn’t throwing right,” said Eddie Kasko, giving him a day off.23 Rather soon thereafter, on April 2, both he and catcher Tom Satriano were placed on waivers for the purpose of giving them their releases and to get down to the 25-man roster. Wagner was 72 days short of qualifying for a pension. On April 7, the Red Sox released him. His major-league pitching stats were 15-19, 3.70. As a batter, it may be just as well he hadn’t tried to make it as a shortstop. In 37 at-bats, he batted .081 — and his on-base percentage was the same. He struck out 26 times. As a fielder, he had an .897 fielding percentage in 78 chances. Wagner was living in Marshville, Massachusetts, at the time and it was reported somewhat vaguely that he would “work with former Patriots end Bob Dee in some kind of ecology project.”26 It was the start of a lengthy business career working for environmental concerns. “We were living on the beach in Marshfield, a little beach called Humarock Beach. There I met Bob Dee, defensive end of the Patriots, at some speaking engagements during the offseason. We got to be friends. He was starting an environmental business called Jetline Service. My degree was a B.S. in Education with a minor in Biology. I was working on a Master’s. We sat down one day on the beach over a six-pack of Budweiser and talked about the future. Lo and behold, I went to work for him. I worked there for about five years. He met some people and formed a partnership with two other guys — one in Virginia and one in Connecticut.” They asked him to go to New Jersey and expand the business there. “I went home and I said to Freddie, ‘It’s a good opportunity.’ Lo and behold, we went to New Jersey and opened the business. In the environmental field. It was a very successful business and that business was sold about five years later. “From there I went to work for Geraghty and Miller down in Tampa for about 10 years. I worked in their government sector. They had a DOD program with multiple Air Force facilities throughout the United States. I ran that government program for them. “After that I went to work for a company called Dragon Rental in Baton Rouge. We did a lot of moving around. I was there for about five or six years. That business was sold and I decided it was probably time to come back to the Midwest. Freddie’s mother was not doing well. It was time to come back. I came back and worked for another environmental company here in Brownstown, Indiana. I was there for 10 years and was going to retire. “Well, if you know me, I don’t sit very well. I don’t sit at all. I was the health and safety officer. I got a call from the mayor here in Seymour, Indiana, looking for a director of safety for the city of Seymour. I said, ‘No, I don’t think so’ — but then a couple of lunches later, well, I did. I was there for another five years. I managed to set up the program, wrote up all the procedures, all the policies, all the guidelines for the safety program. Looking back on his life in baseball, Wagner said, “Maybe it was ‘the old days’ but when I look back at the talent level and I look at the skills sets that those people had — they were extremely good, but I look at the kids today — the people who play today — they’re bigger, they’re faster, they’re stronger. They have better skills. They do a lot of things a lot better than we ever did back then. The game has advanced at a very high level. It’s fun to watch now. I’ll watch three or four games a week. In addition to the sources noted in this biography, the author also accessed Wagner’s player file from the National Baseball Hall of Fame, the Encyclopedia of Minor League Baseball, Retrosheet.org, and Baseball-Reference.com. Thanks to Rod Nelson of SABR’s Scouts Committee. 1 Author interview with Gary Wagner on March 6, 2018. 3 Author interview with Gary Wagner. All otherwise unattributed quotations from Gary Wagner are from this March 2018 interview. 4 Ray Kelly, “Horse’s Hoofs Almost Fatal to Phils’ Hurler,” The Sporting News, May 22, 1965: 15. 5 UPI, “Phillies Sign Eastern Hurler,” Daily Illinois State Journal (Springfield, Illinois), September 9, 1961: 9. 6 Author interview with Gary Wagner. 7 “Engbers Hits First Home Run as Pro,” Evansville Courier and Press (Evansville, Indiana), August 26, 1962: 47. 8 Allen Lewis, “Wagner Again Rules Phils’ Bullpen After Siege With Sore Arm,” The Sporting News, August 31, 1968:18. 9 Bob Wolf, “Wagner Takes Phils Off Relief,” Milwaukee Journal Sentinel, July 1, 1965: 43. 10 Gary Wagner, email to author, April 10, 2018. 11 “Rookie Hurls to 3 Different Catchers for Three Batters,” The Sporting News, July 31, 1965: 20. 12 Allen Lewis, “Phils Flip Over Wagner’s Bull-Pen Concerto,” The Sporting News, July 24, 1965: 15. 13 Ron Coffman, “Phillies Find Extra ‘Relief’ in Wagner,” Evansville Courier and Press, June 6, 1965: 47. 14 Edward Prell, “Phillies Regroup Forces with Trades, Platooning,” Chicago Tribune, February 5, 1966: B3. 15 Ray Kelly, “Wagner’s Relief Plan to Get Test,” Philadelphia Evening Bulletin, February 24, 1967: 27. 17 Fred Ciampa, “Red Sox Hurler Wagner Plans for Big Season,” Boston Record American, February 24, 1970: 22. 19 Larry Claflin, “Things To Remember in Year of Frustration,” Boston Record American, October 1, 1970: 59. 20 Fred Ciampa, “Wagner Important in Red Sox Plans,” Boston Record American, January 13, 1971: 18. 22 Bill Liston, “Wagner and Tatum Welcome Pressure,” Boston Herald, February 7, 1971: 40. 23 Fred Ciampa, “Red Sox Bow to Yanks 9-5,” Boston Record American, March 25, 1971: 24. 24 “Wagner Rejoins Colonels,” The Sporting News, June 16, 1971: 36. 25 Per Sporting News statistics published on July 10, 1971: 37. 26 Bill Liston, Righty Hitter Sox Priority,” Boston Herald, November 9, 1971: 37.